Screen Printed Beach Towel — 29" x 58" 8 lbs./doz. Screen Printed Beach Towel — 30" x 60" 10.5 lbs./doz. About this Beach Towel:100% Cotton.350gsm.9 LBS./Dozen.Lightweight Fabric For Quick Drying.Great For The Beach, Boating Or Any Outdoor Water Activity. About this 4lb./ doz. Fitness Towel w / CleenFreek:This anti-microbial fitness towel measures 42" x 12" and weighs 4lb./doz CleenFreek Antimicrobial Technology is built-in to add protection for your active lifestyle. It prevents bacteria and fungus growth, while helping to fight MRSA, Staph, Germs and Odor. Manufactured By Leeds. Note: Instructions Included: No Materials: 100% CottonSpecial Instructions:Other imprint methods/areas may be available; please call for details. Please note that product images may not depict the standard imprint method included in pricing. About this Colored Beach Towel:10lb./doz. Twill hemmed terry velour beach towel. Manufactured By Leeds. Note: Instructions Included: No Materials: 100% CottonSpecial Instructions:Other imprint methods/areas may be available; please call for details. Please note that product images may not depict the standard imprint method included in pricing. About this 10lb./ doz. Mid - Weight Beach Towel:10 lb./doz. Twill hemmed terry velour beach towel. Manufactured By Leeds. Note: Instructions Included: No Materials: 100% CottonSpecial Instructions:Other imprint methods/areas may be available; please call for details. Please note that product images may not depict the standard imprint method included in pricing. About this 14lb./ doz. Medium Weight Beach Towel:14 lb./doz Twill hemmed terry velour beach towel. Manufactured By Leeds. Note: Instructions Included: No Materials: 100% CottonSpecial Instructions:Other imprint methods/areas may be available; please call for details. Please note that product images may not depict the standard imprint method included in pricing. About this 15 lb./ doz. Colored Beach Towel:15lb/doz Twill hemmed terry velour beach towel. Manufactured By Leeds. Note: Instructions Included: No Materials: 100% CottonSpecial Instructions:Other imprint methods/areas may be available; please call for details. Please note that product images may not depict the standard imprint method included in pricing. About this 14 lb./ doz. Beach Scene Beach Towel:14.0lb./doz,ultra soft velour stock design beach towel. Manufactured By Leeds. Material :100% CottonSpecial Instructions:Other imprint methods/areas may be available; please call for details. Please note that product images may not depict the standard imprint method included in pricing. About this 8lb./ doz. Light Weight Beach Towel:8 lb./doz Terry velour hemmed lightweight beach towel. Manufactured By Leeds. Note: Instructions Included: No Materials: 100% CottonSpecial Instructions:Other imprint methods/areas may be available; please call for details. Please note that product images may not depict the standard imprint method included in pricing. About this 20lb./ doz. Heavy Weight Beach Towel:20 lb./doz Terry velour hemmed heavyweight beach towel. Manufactured By Leeds. Note: Instructions Included: No Materials: 100% CottonSpecial Instructions:Other imprint methods/areas may be available; please call for details. Please note that product images may not depict the standard imprint method included in pricing. About this 14 lb./ doz. Beach Ball Beach Towel:14.0lb./doz,ultra soft velour stock design beach towel. Manufactured By Leeds. Material :100% CottonSpecial Instructions:Other imprint methods/areas may be available; please call for details. Please note that product images may not depict the standard imprint method included in pricing. About this 6.5lb./ doz. Small Colored Beach Towel:6.5lb./doz, terry velour small colored beach towel. Manufactured By Leeds. Material :100% CottonSpecial Instructions:Other imprint methods/areas may be available; please call for details. Please note that product images may not depict the standard imprint method included in pricing. About this 14 lb./ doz. Sandals Beach Towel:14.0lb./doz,ultra soft velour stock design beach towel. Manufactured By Leeds. Material :100% CottonSpecial Instructions:Other imprint methods/areas may be available; please call for details. Please note that product images may not depict the standard imprint method included in pricing. About this Colored Oversized Beach Towel:16.5lb./doz, terry velour, twill hemmed, 100% cotton beach towel. Material: 100% Cotton. Manufactured By Leeds.Special Instructions:Other imprint methods/areas may be available; please call for details. Please note that product images may not depict the standard imprint method included in pricing. About this 12.0lb./ doz. Turkish Cotton Beach Towel:This dobby hemmed velour beach towel measures 32″ x 60″. Grown exclusively in Turkey, Turkish cotton is a premium cotton featuring an extra-long staple. 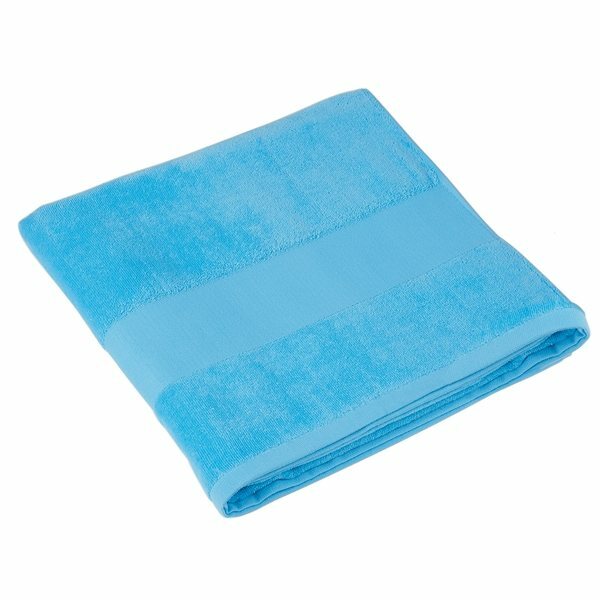 This long staple creates a towel with a high level of comfort, absorbency and durability. In addition, it creates a very soft and premium feeling towel. Combed Cotton has literally been "combed" to remove short, uneven fibers and debris resulting in longer, stronger and more lustrous cotton perfect for weaving.Material: 100% Cotton.Special Instructions:Other imprint methods/areas may be available; please call for details. Please note that product images may not depict the standard imprint method included in pricing. About this 12lb./ doz. Distressed Beach Towel:12.0lb./doz, ultra soft velour, 100% cotton beach towel. Material: 100% Cotton. Manufactured By Leeds.Special Instructions:Other imprint methods/areas may be available; please call for details. Please note that product images may not depict the standard imprint method included in pricing. About this Ocean Wave Beach Towel:10.5lb./doz. Twill hemmed terry velour stock design beach towel.Material: 100% Cotton. About this Screen Printed Beach Towel 29 x 58 8 lbs./ doz. :Our printing capabilities are unsurpassed in the industry! We pay great attention to every detail to ensure your message stands out! About this Full Color Beach Towel - 30 x 60 - 10lbs./ doz:Full color towels offer an unlimited number of imprint colors. Edge to edge printing takes full advantage of the entire imprint area! Material: 45% cotton 55% polyester. About this Full Color Towel - 16 x 25 - 2.5 lbs./ doz:Full color towels offer an unlimited number of imprint colors. Edge to edge printing takes full advantage of the entire imprint area! Material: 45% cotton 55% polyester. About this Screen Printed Beach Towel 30 x 60 10.5 lbs./ doz. :Our printing capabilities are unsurpassed in the industry! We pay great attention to every detail to ensure your message stands out! About this Carmel Towel Company Cabana Stripe Velour Beach Towel:Wrap up in this skin-pleasing velour towel in bold cabana stripes.100% cotton velour.Fiber-reactive dyed.Hemmed edges.10.5 pounds per dozen.Size: 30" x 60".Special Instructions:If ordering less than minimum requirements additional fees will apply. About this 29 x 58 Java Beach Towel:The 29" x 58" Java Beach Towel is the most affordable beach towel anywhere. White only.100% cotton terry velour.8 lbs./doz. About this Rally Towels:With our quick turnaround, this towel is ideal for any sporting event. Hemmed terry loop. About this ColorFusion 30 x 60 Beach Towel (11 lbs./ doz. ):Finally, the ability to let your imagination run wild...on absorbent velour Turkish combed cotton blended towels. 30" x 60", 11 lbs./doz. About this Basic Weight White Beach Towel:Each towel features dobby end hem borders and optical brightening extra clarity to your logo. Our economical basic weight towel surpasses the quality of most midweight towels in the market. 30" x 60". 10.5 lbs./doz. 100% cotton terry velour, white only. Whether you are on a tight budget or not, you will not find a better value. About this 35 X 60 Midweight Beach Towel:When you want to go a step up in size and quality, our Bali 35˝ x 60˝, Midweight Beach Towel delivers. 14 lbs./doz. Available in white, royal blue and red. 100% cotton terry velour.must > 255, Ultrabond padfolio with zippered closure and padded stitched construction. The padfolio features a clean interior that includes file dividers, elastic pen loops, a business card pocket, and a removable matching 3" x 4" jotter. Includes 8.5" x 11" writing pad. About this 6.5lb./ doz. Small Beach Towel:6.5 lb./doz, terry velour small beach towel. Manufactured By Leeds. Materials: 100% CottonSpecial Instructions:Other imprint methods/areas may be available; please call for details. Please note that product images may not depict the standard imprint method included in pricing. About this 14 lb./ doz. Beach Chair Beach Towel:14.0lb./doz,ultra soft velour stock design beach towel. Manufactured By Leeds. Material :100% CottonSpecial Instructions:Other imprint methods/areas may be available; please call for details. Please note that product images may not depict the standard imprint method included in pricing. About this 14 lb./ doz. Surf Board Beach Towel:14.0lb./doz,ultra soft velour stock design beach towel. Manufactured By Leeds. Material :100% CottonSpecial Instructions:Other imprint methods/areas may be available; please call for details. Please note that product images may not depict the standard imprint method included in pricing. About this 18 lb./ doz. Colored Beach Towel:18lb/doz Twill hemmed terry velour heavy weight beach towel. Manufactured By Leeds. Note: Instructions Included: No Materials: 100% CottonSpecial Instructions:Other imprint methods/areas may be available; please call for details. Please note that product images may not depict the standard imprint method included in pricing. About this 12lb./ doz. South Beach Beach Towel:12lb./doz,velour, hemmed, 100% cotton midweight beach towel. Material: 100% Cotton. Manufactured By Leeds.Special Instructions:Other imprint methods/areas may be available; please call for details. Please note that product images may not depict the standard imprint method included in pricing. About this 12.0lb./ doz. Turkish Cotton Beach Towel:This dobby hemmed velour beach towel measures 32″ x 60″. Grown exclusively in Turkey, Turkish cotton is a premium cotton featuring an extra-long staple. This long staple creates a towel with a high level of comfort, absorbency and durability. In addition, it creates a very soft and premium feeling towel. Combed Cotton has literally been "combed" to remove short, uneven fibers and debris resulting in longer, stronger and more lustrous cotton perfect for weaving.Material: 100% Cotton. About this Carmel Towel Company All Terry Beach Towel:6.5 oz100% cotton, Hemmed at ends Special Instructions:If ordering less than minimum requirements additional fees will apply. About this TURKISH SIGNATURE SPORT HAND TOWEL:Great for bowling, fishing, weight lifting, running, and more. This velour 100% towel represents outstanding Turkish quality. Features dobby borders and double-sheared finishing for extra softness and luster. 12” x 17”, 1.2 lbs./doz. Thank you Mae and Lauren! We’re glad you like our promotional beach towel. These are fun to give for outdoor events! The 29” x 58” Java Beach Towel is on our Top 100 items, because the price and quality can’t be beat! The 29" x 58" Java Beach Towel is the most affordable beach towel anywhere. White only. 100% cotton terry velour. 8 lbs./doz. Thank you Kelly! We’re glad to hear your positive review. This promotional towel is also a huge hit with our customers. The 30” X 60” Standard Weight Beach Towel is great for the hot summer months. You can use this custom beach towel anywhere! Whether it’s at the beach or your backyard, this beach towel is a perfect promotional towel. At 30˝ x 60˝ and 10 lbs/doz, the Fiji Standard Weight Beach Towel, pound for pound, is the most affordable beach towel anywhere. Order your 30” X 60” Standard Weight Beach Towel here! Thank you Francisco and Chelsea! This promotional beach towel has been skyrocketing in popularity. Customers won’t want to miss out on this great marketing tool! Lightweight Fabric For Quick Drying. Order your Beach Towel here. We have many promotional towels available in our selection for you to choose from. You’ll be able to find the perfect one to represent your company name and logo! We have different styles of custom beach towels available for color imprint, embroidery, full color imprint, tone on tone imprint, and more! Get the imprint you desire on your beach towel! Beach towels are great for pool parties, river trips, lake trips, and beach trips. You could also use a beach towel to tan in the comfort of your own backyard. We have many styles that will fit your exact promotional needs. Promotional beach towels are great for people who love to take in the sun! Place your logo on the beach towel to go along with your customer. Look through our selection of beach towels. Shop here! Trade show and event guests are bombarded with lackluster swag at every opportunity, so it is extremely important to stand out. 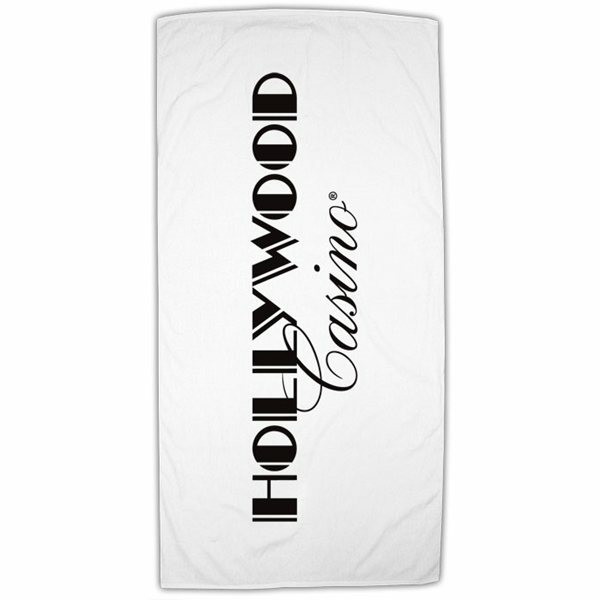 Our custom beach towels are specially priced and proven to generate impressions and fun! Search our site for a wide selection of promotional beach towels and see for yourself how high our standards are when it comes to brand impact. Click through our inventory of promotional beach towels on sale now. Here is a snapshot of our selection of 58 custom beach towels currently available. We’re ready to help expedite your order, so give us a call! USA Made Towel — 34" x 66"
USA Made Towel — 16" x 26" 3.5 lbs./doz. Grab your promo beach swag today! Promotional beach towels are great for any events close to summer! Customers will love to receive these to take on their next outdoor trip! If you’re aiming to do a giveaway before or during summer months, then promotional beach towels are great to give to customers! Don’t miss out on this great marketing tool. Our featured list of beach towels are fun for beach goers! When it comes to beach towels, you’ll definitely get two thumbs up.